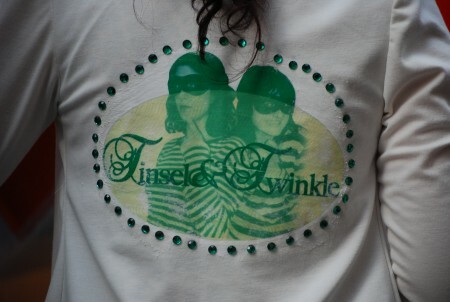 It must have been a very strange experience for the artist duo Tinsel & Twinkle to see people literally running away from their performance on a busy Viennese street (Graben), not knowing that they were standing at the one of the favourite spots for promoters of non-profit organizations. It took a while for the local people who were attempting to avoid what they thought to be yet another group of interviewers, to realise that the two women dressed in eccentric uniforms were not after their money. What has begun as an amusing game of hide-and-seek eventually turned into an active exchange of thoughts and feelings about money between the passers-by and the artists with their “Bank of Tinsel & Twinkle“. 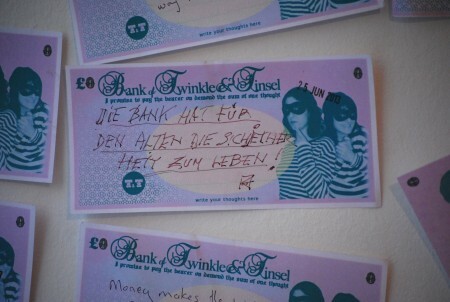 The general idea of this artistic project which came to life in 2012 in London is to give people the opportunity to say how the money could be used more positively and to give their ideas for solutions to the global financial problems. They are then given a blank Tinsel & Twinkle bank note to write their thoughts upon, and in exchange they receive a stamped and dated bank note with another thought back. – We are accustomed to hearing politician’s opinions or media reports about the economy, but our bank gives the power to the people. It gives them the opportunity to voice their opinions and we are interested in what they have to say. As the collection of thoughts builds, hopefully it will start to represent what we can do collectively to make a difference, explains Tinsel Edwards for our blog. 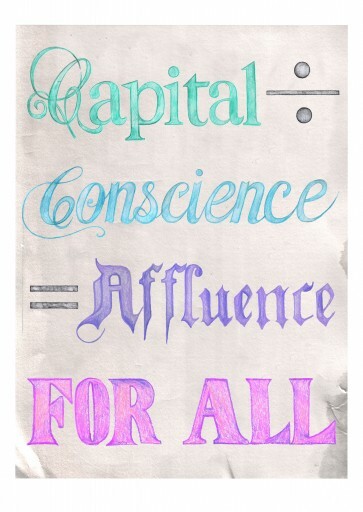 The artists have come up with a very simple mathematical sum which at its root is the ethos of The Bank of Tinsel & Twinkle – “Capital divided by conscience = Affluence for all’. This has been the basis for their first collaborative print which they are selling and contributing a donation from each sale to the UK charity Just For Kids Law. The performance “Bank of Tinsel & Twinkle” was part of the exhibition Affluence and Avarice at Galerie Michaela Stock in Vienna, the duo’s first collaborative show in Austria. The title was inspired by the painting An Allegory of Avarice by Albrecht Dürer (1507), a small-scale oil painting depicting a women in progressing age clinging to a sack of money, as painter’s simple reminder of greed’s pointlessness as wealth can’t buy you longevity. This master-piece is part of the permanent collection of Vienna’s Kunsthistorisches Museum. For Tinsel and Twinkle whose individual work in the past couple of years has been influenced by the phenomena of greed and even more so, by consequences of the global financial crisis, the choice of greed as the topic for the Vienna show was obvious. They took Dürer’s painting as the starting point, choosing to adapt the title to “Affluence and Avarice”, with “affluence” as a clear reference to topics dear to their hearts. Ever since their graduation from art academies, Tinsel & Twinkle have collaborated on projects and exhibitions including several interactive art stunts, such as dressing up as traffic wardens and issuing free art wrapped in parking-ticket envelopes or staging a “kidnapping of a banker” (and holding him hostage) as part of their Mini retrospective at A-Side B-Side Gallery at Hackney Downs Studios in London last year. Being friends since childhood, they share a long history of joint projects which started when they, at the age of nine, formed a YO! Gang with its own magazine with illustrations of their favourite album covers and stories. Music was actually always one of their strongest connections, so when they many years after formed another group called Fairies, this time with their two best friends – Sparkle and Tinky, they soon turned into a eight-piece punk rock band. They used to wear wings wherever they went and grant wish vouchers to people, getting all kinds of reactions from the most positive to aggressive, when people would even try to burn their wings. It was precisely this interaction side that always fascinated them, which led them start making artworks about it. Tinsel & Twinkle share passion and drive to create work which makes observations, questions their surroundings and highlights issues. They both use paint, which they both have been separately exploring and pursuing as their chosen medium since childhood. The selection of paintings and giclée prints by Tinsel & Twinkle exhibited at Galerie Michaela Stock is a micro-cosmos of their politically motivated work. They never painted together and yet the carefully chosen motives for a smart (and very often humorous) dissection of current social and societal problems such as financial crises, growing poverty and greed, witnesses of their shared moral believes. The human condition and it’s struggle to learn and change, causing history to repeat itself is one of my main themes. Therefore historical references are pivotal to my exploration of this idea. One of my main sources of exploration for these ideas is to look at stories from the past, mainly fables and mythology. These stories often depict the challenges I am discussing in my work such as greed and war, which reveals how we have battled with them for hundreds and thousands of years. In these stories the characters are animals or anthropomorphic representions of human traits and ideas, and this opened up a wealth of visual references for me. Historically animals are loaded with symbolism, and it is in these stories from which I can extract the symbolic references I am interested in, as the stories are so pertinent to today’s modern world. 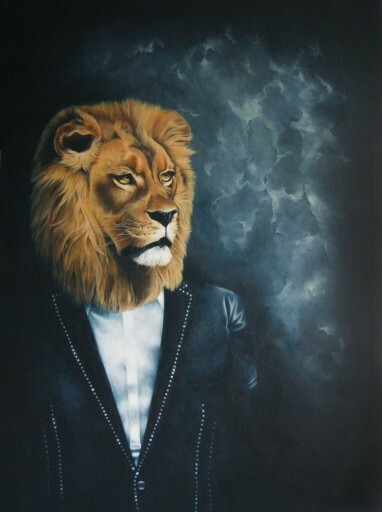 My painting The Sick Lion is a character from The Fox and the Sick Lion, it is an Aesops fable which has many very early economic interpretations. Socrates used this fable to criticise and convey the `get rich quick´ culture of the Roman bankers. In the painting the Lion looks fine on the surface, but underneath his sickness is human greed. 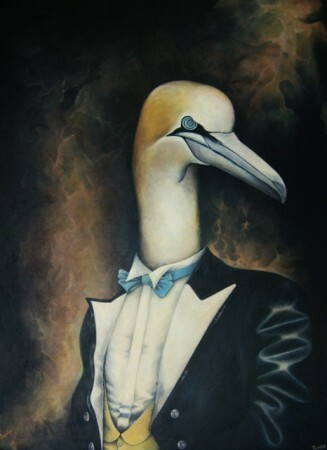 This painting has visual references directly linked to British politics which is The Bullingdon Club members suit, upon which is the head of a gannet, a bird known the world over for it’s never ending appetite.My initial and main question when making this piece of work was ‘how much is enough?’ and in particular when it comes to decisions being made by politicians who are already wealthy making cuts from those who are struggling to get by. The Bullingdon Club is a notorious club for very rich young men at Oxford University. A lot of UK politicians have been members including David Cameron and Boris Johnson. The club was known for damaging and destroying restaurants and bars after hours of consuming food and fine wine. With these same politicians and people in power making cuts to some of our most valued facilities like the NHS, the fire service and teachers pay to name a few also trying to bring in new laws to increase the price of alcohol to deter poorer people from being able to afford it in order to make savings on the NHS, these double standards and acts of greed by the government created images of gannets swirling over our heads, ready to swoop and take what they can, even though they themselves have full bellies. It is taking a stand against governments taking more and more of those who have the least to ensure more and more for those who have the most. The title of my painting is taken from an ancient Greek playwrite called Aescylus, and to me the amazing thing here is that this isn’t a recent expression but one that is thousands of years old. I explored the Greek Gods and found Apollo was the God of Truth, and that the crow was the symbol of this element of Apollo. 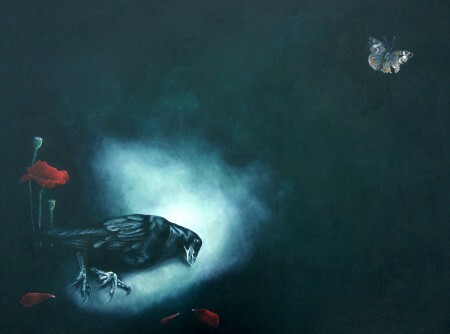 And so I used a dead crow as a metaphor for truth dying. I saw an image on TV of the London conference in 2011 about the Afghanistan war, and immediately this image struck me as ironic. 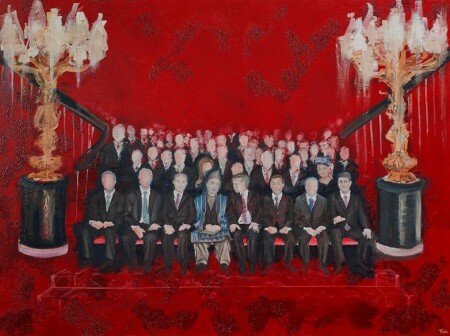 A sea of black suited politicians amongst opulence, ornate gold and red flock-patterned carpet, the situation seemed so far removed from the reality and horror of war. For me, the story of this image resonates with its own powerful political presence. I wanted to interpret this image in paint not just to highlight the irony of the situation, but to make a point about how war affects so many innocent civilians. On the day I finished the piece I decided on the title: ‘9 Years and 89 days, on going. Civilian deaths 34, 240, Military deaths 2,208’ (based on information found on Wikipedia), the number of casualties of innocent people is shocking. For me the paint is particularly important here, I wanted to make a piece of work which had a strong, powerful message, but with sensitivity. I think that by using paint in an intuitive, expressive way it somehow removes it by one level, altering the image with a subjective brush mark helps it to retain an emotive quality. It took me a long time to decide about whether I could or should make a piece of work about war, living in London my everyday life is so far removed from what is happening in Afghanistan or any war torn country, there is no way I can understand the complexities of war or begin to understand how it is affecting people. However I strongly believe that if we all take responsibility and make small actions in our own way that together we can make a difference and make a stand for peace. In the context of the Affluence & Avarice exhibition this painting is not an overt reference to greed, but war is inextricably linked to power, money and greed.